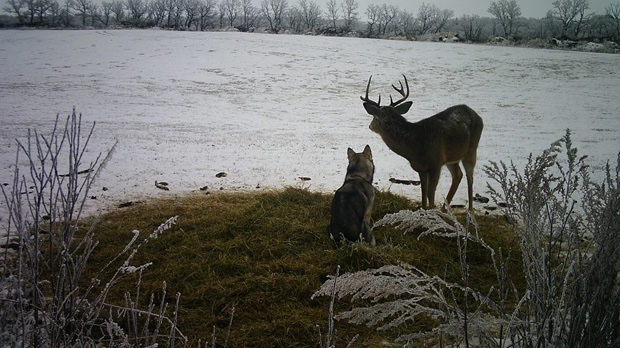 A hunter found thousands of photos of Koda and a buck together captured by his game camera (Facebook/Rachel Howatt). When a southern Manitoba dog went missing her owners feared the worst, but as it turns out, Koda the Siberian husky had just made a new friend. Rachel Howatt and her boyfriend Clinton Sibbick from south of Manitou, Man. said their one and a half-year-old dog went missing from Howatt’s mother’s farm for three days just before Christmas. “At first I was optimistic that she’d come back, but then it got to be the second or third day and I started to think the worst. We were pretty worried,” Howatt said. Koda returned safely, but Howatt said she kept leaving for a several hours every few days. The answer to her questions over where her “renegade husky” had been going was brought to her by a neighbour of her mother. “He’s an avid hunter and he has a number of game cameras set up in the valley to keep an eye on everything and monitor the deer on his land,” she said, referring to the Pembina Valley region. When the neighbour was on vacation for five weeks, he came back to find thousands of photos of Koda and a buck together. 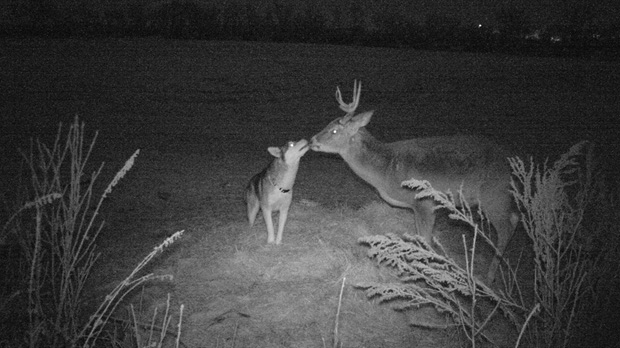 The game camera caught the husky sleeping, eating, and playing with the buck during the time she was missing. Howatt says Koda doesn’t usually leave her property, and only goes off on her own when they visit Howatt’s mother. “I think it was to check up on her friend,” she says. Koda’s friendship with the buck has become something of an internet sensation. Howatt posted about the unlikely friendship on Facebook earlier this month and it already has more than 35,000 interactions and 22,000 shares. “People are really enjoying the photos and are saying it’s made their day,” Howatt said.